Edited by John Martin, Canongate, Edinburgh, 2010, 528 pages. You have to admire Bukowski for his tenacity to prove himself as an original artist and for his enormous body of work. I’m not too sure what Buk would make of his revamped, posthumous career, but he is becoming increasingly famous and this is the 14th major publication of his creative work since his death in 1994. The large blurb on the back cover of this new UK release claims: THE BEST OF THE BEST OF BUKOWSKI. As pointed out by Zachary T. Ciulla, about half of the poems collected in this volume were not published until after Bukowski’s death. It is difficult to imagine Bukowski allowing a lot of this material to be published, but I suppose it is of sufficient interest to appeal to a Bukowski fanatic or scholar. There are some astounding poems in this collection, such as ‘The Genius of the Crowd’, ‘Dinosauria, we’ and ‘the bluebird’ but there is also a lot of second or third-rate filler. You can sometimes read 100 poems in a stretch and not find one worthy of detailed future consideration. I get the impression that Bukowski’s long term venerable editor John Martin slapped this one together, tossing in the mix, dozens of uncollected or newly published poems to give the volume a fresh, previously unread feel, even amongst Buk's most ardent followers. The book is certainly worth reading, but overall, a vast majority of the poems did not challenge me or extend my understanding of the Bukowski canon. 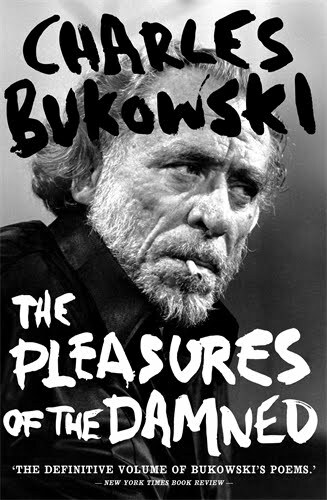 If you are a novice reader of Bukowski, rather than waste your hard earned bucks on 'Pleasures of the Damned' check out some of his finer earlier work- he actually agreed to have published during his lifetime. You can’t go wrong with LOVE IS A DOG FROM HELL (1977), BURNING IN WATER DROWNING IN FLAME (1978) or WAR ALL THE TIME (1984). The poems in the collection during Buk's life are largely taken from his earlier collections up until 1979 while his posthumous work is largely drawn from the collections What Matters Most Is How Well You Walk Through the Fire (1999) and The Night Torn Mad with Footsteps (2001). Important collections, such as, The Flash of Lightning Behind the Mountain (2004) are totally ignored. I suppose Martin chose this material from a gut-level. Hope he eventually churns out a detailed book about his relationship with Buk and his real hand in the editing process.